Agenda and list of speakers for the evening. Before: Pleasantly surprised at both the turnout and the makeup of the audience. This is the first diversity event dominated by a diverse group of attendees. 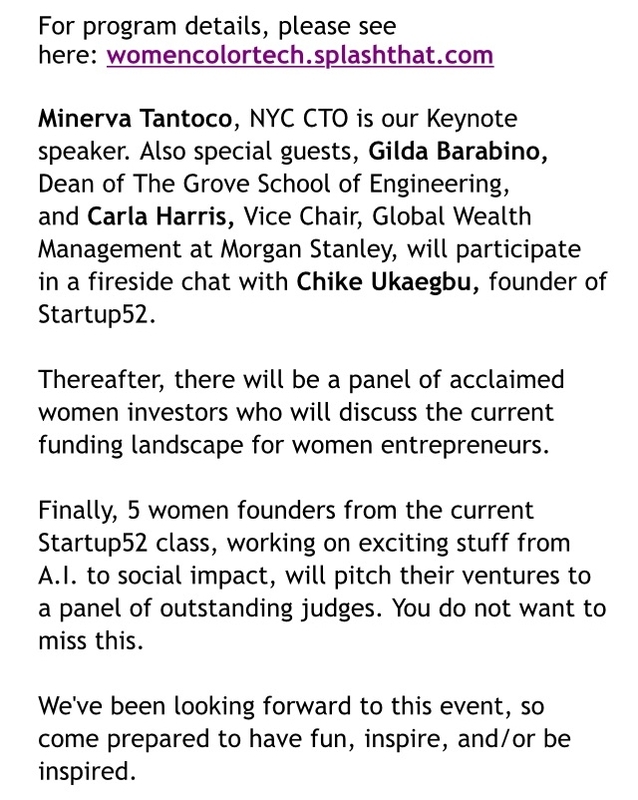 Also the first diversity related event in which there seem to be more corporate than startup. - "diversity is super profitable." - No pomp and circumstance, getting right into the speakers and the meat of the event. - First all black panel I've seen. Badass. Overall: Very strong event around diversity and women of color in tech. Microsoft partnered with Startup52 brought together insightful and bold panelists and speakers who weren't afraid to give some real talk about problems, solutions, and how they've been affected as women in STEM industries. Well, anything was better than the status quo, so the training began. It was entertaining, frustrating, and involved a lot of vacuuming of excess litter during the training process, and the whole thing was a great learning experience for us both. Toilet training my cat was a result of necessity. My quiet literal “smelly situation” needed to end and I took action. A simple purchase click of the CitiKitty kit and there was hope for a better situation by challenging the cat, my New York life, and me. Niko was quite open to the new litter contraption. For the 6 weeks where the litter tray resided on my toilet there was much cheering and positivity. The cat was succeeding! I was still cleaning clumps from a tray, but hey, it was all flushable contents! By the end, Niko was toilet ready each and every time. I took initiative to make a smelly situation better and into one where everyone’s quality of life is better. It doesn’t get much more amazing in my crazy cat lady book! It reminds me that each and every day awesome events are all around us. Toilet training Niko (and the comedic aftermath) has had a profound effect on my enjoyment of life with a ‘stop and smell the flowers’ mentality. Many don’t believe me that my cat uses the toilet (thank you, video function on my phone for allowing proof at all times), but boy is it a great conversation starter. There are volumes written about the best way to begin chatting with someone you don’t know. Niko has provided me a great intro to a conversation, it is important to find (or take action) to find yours!